Fort Hood was named for the famous Confederate Gen. John Bell Hood, an outstanding leader who gained recognition during the Civil War as the commander of Hood's Texas Brigade. The military base is located adjacent to Killeen, Texas, in the beautiful "Hill and Lake" country of the Great State of Texas, approximately 60 miles north of the capital city of Austin and 50 miles southwest of Waco. The rolling, semiarid terrain is ideal for multifaceted training and testing of military units and individuals. It is the only post in the United States capable of stationing and training two Armored Divisions. Fort Hood is " The Army's premier installation to train and deploy heavy forces. Fort Hood is a three hundred and forty square mile installation. Fort Hood soldiers use state-of-the-art training facilities. Housed in the Close Combat Tactical Trainer are exact replicas of tank and Bradley fighting vehicle crew compartments, which allow troops to play realistic video-game type scenarios to familiarize themselves with the equipment and how to interact as a unit before taking the equipment to the field. Fort Hood is a 339 square mile installation approximately 60 miles north of Texas's capital city of Austin and 50 miles south of Waco. 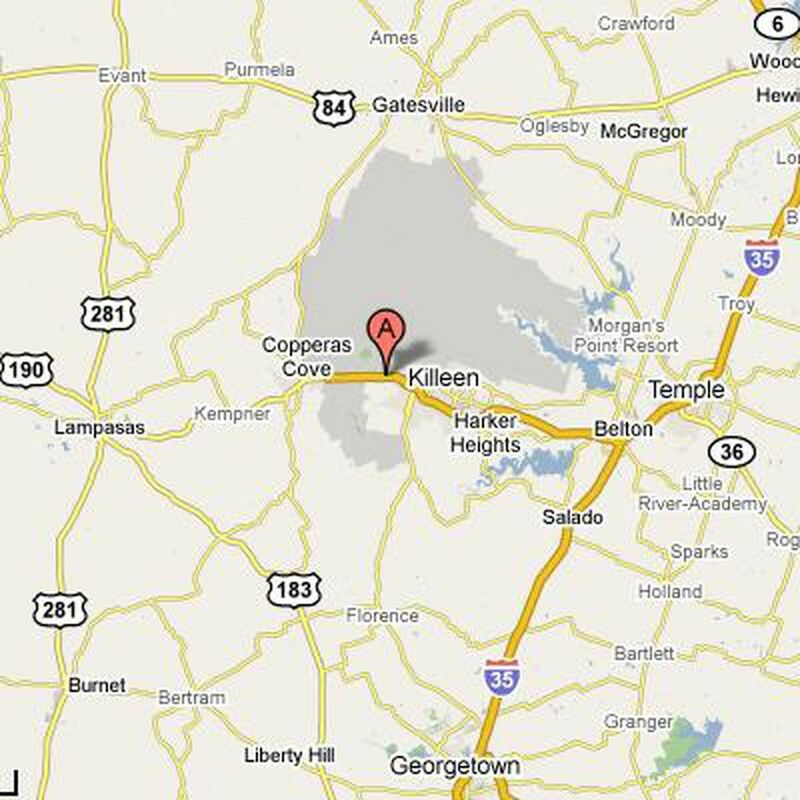 The city of Killeen borders Fort Hood to the east and Copperas Cove borders Fort Hood to the west. In addition to the 1st Cavalry Division and the 4th Infantry Division, Fort Hood is also home for the Headquarters Command III Corps, 3d Personnel Group, 3d Signal Brigade, 13th Corps Support Command (COSCOM), 13th Finance Group, 89th Military Police Brigade, 504th Military Intelligence Brigade, the 21st Cavalry Brigade (Air Combat), the Dental Activity (DENTAC), the Medical Support Activity (MEDDAC), Army Operational Test Command (AOTC) formerly TEXCOM, and various other units and tenant organizations. The overall post population is estimated at about 71,000, of which are almost 42,000 soldiers. The rest are family members living on post, employees of the Army Air Force Exchange Service, volunteers, and other employees. The 1st Cavalry Division is staffed with more than 17,000 soldiers, while the 4th Infantry Division has more than 11,000. The 13th Corps Support Command has about 5,600, the 3rd Signal Brigade has 1,600 and the 89th Military Police Brigade has almost 1,000. Also: the Headquarters Command has about 850 soldiers; the 3rd Personnel Group with almost 800; the 21st Cavalry Brigade with more than 300; the 21st Replacement Company with more than 150; and other units at Fort Hood have about 1,200 soldiers. There are more than 37,000 enlisted soldiers and more than 3,700 officers. In addition, more than 300 Air Force airmen are on duty at the post. Temporary Lodging at Fort Hood information and reservations are made at Building 111, on Hood Road, Ft Hood. The phone number is (254) 532-5157, DSN 737-2700, or you may call the Poxon House at (254) 532-2100 Hours: 0630-2200, 7 days a week Worldwide reservations can be made by calling 1-800-GO-ARMY-1 (1-800-462-7691) or DSN 897-2790. Transient Lodging information and reservations may be made in Building 36006 (High Rise) on Wratten Drive, Ft Hood, or you may call (254) 532-5157 DSN 737-2700, 24 hours-a-day, 7 days-a-week. Lodging is available to personnel at Fort Hood for TDY or annual training and PCS status. Visitors may stay on a space available basis. These facilities feature in-room telephones, televisions, private baths, and microfridges. At Fort Hood residing in on-post housing is voluntary, not mandatory, except for personnel assigned to Key and Essential Positions, as designated by the Installation Commander. In processing through the Housing Services Office is mandatory. Lend Lease Actus manages the privatized housing on Fort Hood. Privatized housing consists of 12 villages with over 6,100 units of military housing, ranging from single houses to eight-plexes and two to five bedrooms. There are 5,814 units for enlisted personnel and 618 units for officers. Waiting periods vary, based on bedroom requirements and the number of personnel on the waiting lists. Most newly assigned personnel will be required to live off-post for some period of time. The waiting period for enlisted personnel varies from 1 month to 24 months and for officers from 2 months to 12 months. Soldiers desiring to apply for on-post housing must do so within 30 days of their arrival at Ft Hood to receive an eligibility date back to the date of departure from last permanent duty station. If an application is made after the initial 30 days, the eligibility date will be the date of the application. All soldiers in grades E-1 and above with a family housing requirement may apply for on-post family housing. The public school system serving Fort Hood and the cities of Killeen, Harker Heights and Nolanville is the Killeen Independent School District. In addition, there are a number of private and parochial schools from which to choose. KISD's students attend 27 elementary schools, eight middle schools, four high schools, and four special campuses. Transportation is provided free for students who live two or more miles from their assigned school or in a hazardous area, and special education students are transported from their homes regardless of distance from the school. The Young Men's Christian Association (YMCA) sponsors a before- and after-school program at KISD schools. The program allows students to come into the schools from 6:00 am until school starts in the morning and from the time school ends until 6:00 pm in the evening. The Special Education Department is geared to the individual needs of students with disabilities. These services are provided in addition to the regular classroom, or in place of it, as determined by the student's Individual Education Plan (IEP). Copperas Cove ISD is a public school district serving students in Copperas Cove and surrounding areas. Central Texas College and Tarleton State University are two state-supported higher education institutions in Killeen which offers junior, senior and graduate courses. Both Central Texas College and Tarleton State University have day and evening classes available at On-Post at the Soldier Development Center. Saint Mary's University offers classes On-Post on Saturday's on an eight-week cycle The University of Mary Hardin-Baylor is just 17 miles away, and the University of Texas and Baylor University are about60 miles distant each, and Texas A&M University is about 100 miles away. All on post colleges are located in the Soldier Development Center. Fort Hood Child Development Centers (CDC) has childcare available for Active duty and active duty reservists, family members of military personnel, Department of Defense (DoD), appropriated and non-appropriated fund employees, and contractors. Retirees are eligible on a space available basis. Central Enrollment Registry is found at Battalion Avenue, Bldg 283. The Hours of Operation are 7:30 a.m. - 4:30 p.m., and the phone number is(254) 288-3189 (254) 287-8029/288-7155. The CDCs are open Monday through Friday, 5:30 am until 6:00 pm. There are four Child Development Centers (CDC) on Fort Hood offering full-day care for children 6 weeks - 5 years old, Mon -Fri, 0530 to 1800. Special Needs Care is available and based on care needs. Determined to meet Total Army Family, CYS now includes a Mildly Ill Care (MIC) home and two Child Development (CD) Homes. The MIC home is designed to care for children too ill to participate in their regular child care program but is not too ill (according to their doctor) to be in childcare. The CD homes are specifically designed to provide a variety of care options, to include: infant/toddler, respite, hourly, shift work, extended and transition care. The CD Homes will offer round the clock care and are supervised and managed by the CYS Family Child Care Program Director. Child Care fees are based on total family income. The Family Child Care program offers programs with family settings. The phone number is 254-287-5448. The SAS program , before and/or after school care for youths 5-12 years old (must be in kindergarten). Full day programs are offered during school holidays but are closed on federal holidays. Carl R. Darnall Army Medical Center (CRDAMC) provinces medical services for Fort Hood. CRDAMC is a subordinate command of the United States Army Medical Command, Fort Sam Houston, Texas. Carl R. Darnall Army Medical Center is one of the largest and busiest medical centers in the Army. Carl R. Darnall Army Medical Center family care clinics, troop medical clinics, and Women's Health Center offer the highest quality care to more than 42,000 active duty personnel and more than 145,000 family members and retirees within a 40-mile radius. An average seven births a day are expected at the hospital. Also on an average day, the staff at Darnall handle 3,867 outpatient visits, 26 surgeries, 31 admissions, 170 Emergency Room visits and fill 5,000 prescriptions. To receive health care at Darnall and its clinics, family members must be enrolled in TRICARE Prime.